On the business side of things, I spend lavishly on gear. I buy top-of-the-line Apple computers, then pimp them out with as much memory and storage as possible. I recently bought some expensive audio and video equipment to help with the GRS YouTube channel. I pay a lot for this gear, but I don’t regret it. In my personal life, I have season tickets to the Portland Timbers, our local pro soccer team. These tickets cost $1050 each this year (and I have two of them), or about $62 per game. The price increases to $1150 each next year (or about $67 per game). This might seem exorbitant to some people — especially when you consider costs for parking, food, etc. — but I’m fine with it. I get a lot of pleasure from these games. This morning, my mind drifted back to this question again. It occurred to me that it doesn’t bother me that I spend on either of these things, and I doubt that it would bother other people either. These are deliberate expenses. They’re purchases I make mindfully and that bring me both joy and satisfaction. This is how money should be spent. If I were to answer the question today (now that I’ve had a week to think about it), I’d say that my biggest spending problem is buying things that I might want to have in the future — but for which I have no use in the moment. Earlier this year, I wrote about the abundance mindset and its evil twin, the scarcity mindset. With a scarcity mindset, you believe that everything is limited. With an abundance mindset, you believe there’s plenty for everyone. A scarcity mindset can manifest in many ways. Sometimes it leads people to be jealous and spiteful, to be resentful of others. Sometimes it makes people afraid of the future, makes them feel like they’ll never have enough. For people like me, however, a scarcity mindset leads us to want instant gratification. Deep in my money blueprint, there’s something that makes me afraid of missing out. As a result, I want things now now now! My desire to buy and have things now is a deeply-ingrained money script that overrides my rational brain. Here’s how I operate: If I discover a book or a song or a game or a movie that looks interesting, I buy it. If it’s something that I think I’ll want to read or hear or play or watch in the future, I pick it up now, even if I’m nowhere near ready to read or hear or play or watch it. 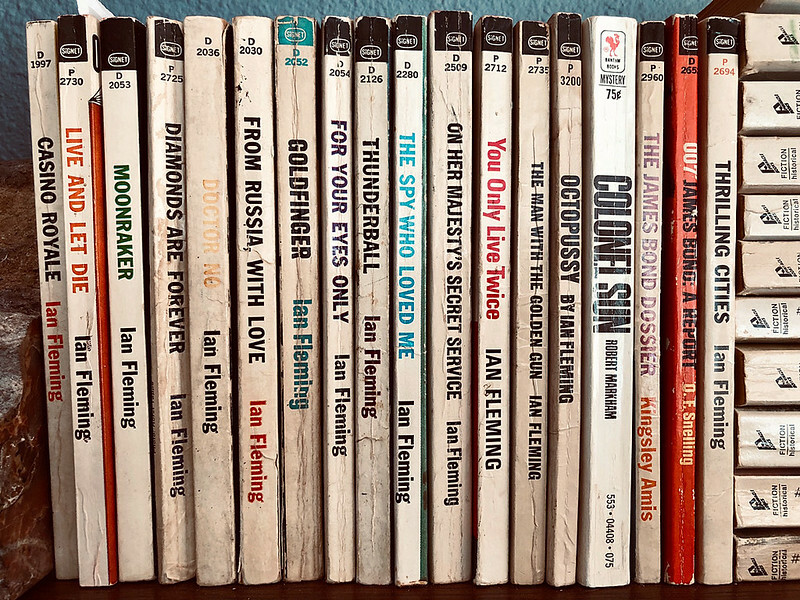 Earlier this year, for instance, I decided I wanted to read all of the James Bond books in order. There aren’t many (and it’s easy to find cheap used paperback copies), so I bought all fourteen of them at once. I plowed through the first six books, then slowly read three more. My interest waned with the quality of the novels. It’s now been several weeks since I last picked up The Spy Who Loved Me, and I’m skeptical I’ll ever finish it (or the other four books in the series). But I own all fourteen because I bought the entire series at once. I could also use the Alfred Hitchcock films as an example. A couple of years ago, iTunes had a $50 bundle containing maybe a dozen Hitchcock films. What a bargain! I bought it. Since then, I think I’ve watched North by Northwest, Rear Window, and Vertigo. I’m not sure when I’ll watch the other nine movies from the bundle. A bargain isn’t a bargain if you don’t use it, right? While these twelve films cost me about $4 each, if you apply that $50 to the three films I’ve actually watched, my average cost is over $16 per picture. That’s not such a bargain. These are minor examples, I know, but I feel like I’ve spent my entire life buying things to fill potential needs. In the olden days, this led me deep into debt, which sometimes made it tough to meet actual needs. Nowadays, pursuing potential tends to make my life cluttered and chaotic. I’m nearly fifty now. In my thirty years as an adult, my scarcity mindset has led me to purchase a lot of things that have gone unused. The potential needs remained potential. They never materialized. Around the time I started Get Rich Slowly in 2006, my personal library had grown to over 3000 books, most of which I’d never read. Why did I own 3000 books? Part of it is because I love books, yes, but a larger reason was that I thought I might want (or need) each of those books at some point. Eventually, I recognized the folly of of my ways. I purged 80% of my personal library. I still own several hundred books, but today I have a reason for owning most of them. I have an active reference library for subjects I deal with every day — personal finance, personal development, etc. — and have (mostly) eliminated the books I was keeping to solve potential future problems. It’s not just books I’ve bought to fill potential needs. I built a collection of 7500 comic books that I barely read. I owned dozens of board games that I never played (but might want to someday). I had a huge wardrobe of clothes, many of which had been worn only once or twice. During my divorce, I purged a lot of stuff from my life. As I did, I was amazed and how many things I’d purchased in the past not because I needed them, but because I thought I might need them in the future: Voice recorders! Power tools! Yard tools! Travel gear! All sorts of gadgets and gizmos! Fortunately, I’m making progress. It’s slow progress but it’s progress. Living with Kim for the past six years has helped. While Kris wasn’t necessarily a spendthrift (just the opposite, in fact), she and I had similar tendencies to buy things “just in case”. (For Kris, this meant buying tons of kitchen gadgets and food-prep items.) This isn’t in Kim’s DNA. It’s not a part of her money blueprint. She doesn’t buy something unless she has an immediate need for it. Our RV trip was eye-opening too. Living in so little space, it just wasn’t possible to carry a lot of contingency items. When a problem arose, Kim and I dealt with it in the moment. There was no room to carry anything for potential needs. My progress is especially evident with big, expensive stuff. Longer ago, I felt like part of being a responsible homeowner was having a workshop filled with high-quality tools — even if I rarely (or never) used them! It was easy for me to rationalize owning a $500 compound miter saw because I might want to use it someday. Nowadays, I only buy a tool if I have an immediate need for it and I believe it’s likely I’ll need it again in the future. A new hedge trimmer? That’s a no-brainer. I bought one in April because I needed it to tame our ivy, and I’ll need it again every spring and autumn that we live here in our country cottage. But when I needed a compound miter saw to cut baseboard molding in June? I rented instead of buying because I don’t anticipate needing one again for a long, long time. Don’t get me wrong. I’m not saying it’s bad to want things or to buy new things when you need them. What I’m questioning in myself is my compulsion to buy things before I’m ready to use them. I’m questioning my tendency to accumulate things because I might want to use them or I might need them someday. What if, in the future, I lived by these guidelines? If I want to watch a movie, and I’m going to watch it right now, then I give myself permission to buy it. If I want to read a book, and I’m going to read it right now, then I give myself permission to buy it. If I want to play a game, and I’m going to play it right now, then I give myself permission to buy it. If I need a tool for a job, and I’m going to use it right now, then I give myself permission to buy it. What if, in the future, I changed the core question I’ve been asking myself? In the past, that question has been, “Do I want this?” If the answer was yes, then I bought it. In the future, the question should be, “Will I use this right now?” If the answer is yes, then I can give myself permission to consider the purchase. But if the answer is no, I won’t use it immediately, I need to learn to wait.